Join Webster University Sustainability Wednesdays from 12-1 p.m. during the summer months beginning May 30. Learn about strategies and solutions being created and used right here in our local community to improve environmental, social and economic sustainability on a global scale. The lunch lectures will take place every Wednesday during summer with free box lunches provided! After the final session on Aug. 1, attendees will be entered into a drawing to win a free copy of Missouri Harvest: A Guide to Growers and Producers in the Show-Me State! Attendees will receive an entry for each session attended. More details, such as speakers and building/room locations, can be found online at webster.edu/sustainability. Parking is available in Garden Park Plaza parking garage. For more information contact Kelsey Wingo at kelseywingo07@webster.edu. RSVP online to reserve a spot and a lunch! *Subject to change. Be sure to RSVP for events you plan to attend. May 30: "Local Impacts and Global Goals"
June 6: "Crossroads of Immigration & Sustainability"
June 13: "The Importance of Eco-Literacy"
June 20: "The Era of Living Buildings"
June 27: "Understanding a Growing Population"
July 11: "How Do We Fit into Nature?" 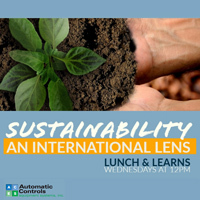 July 18: "Resource Scarcity: All for One, One for Who?" Aug. 1: "Youth in the Climate Fight"